Bucket lists seem to be quite the thing lately. I’ve seen a lot of blogs doing “30 by 30” or “12 in 2012” series on their blogs. While I think that’s an awesome idea, I’d kind of rather keep my list in my head. That way if I don’t get to everything on it, I’m the only one that’s disappointed. Besides, my list is ever evolving. It needs space to grow. 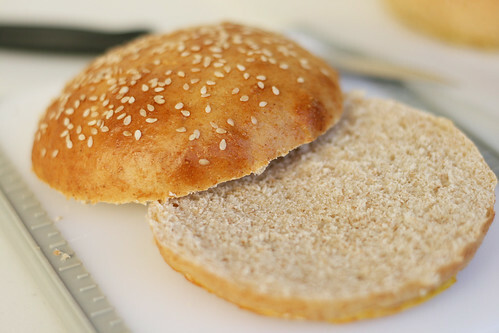 Homemade hamburger buns have been on my mental bucket list for WAY too long. I have no idea what I was waiting for, but I can tell you that now that I have made them, they’re here to stay. I did a lot of research and even when I found one that sounded perfect I still decided to make a small tweak. I like trying to include whole grains in my baked goods when I can so I hoped that I could make that substitution and still have a good result. I didn’t do a full half and half substitute because I didn’t want the buns to be too heavy. It worked! And the buns were everything I hoped they would be. 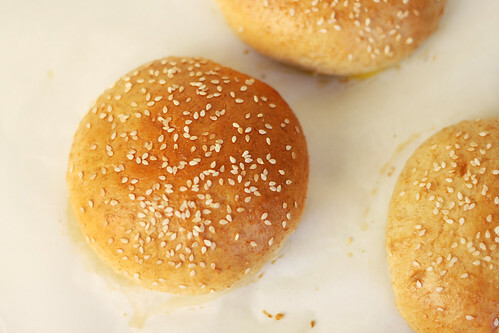 If you’ve been considering making your buns, give these a try! They are not nearly as intimating as you might think. Really, they’re no more difficult than making any bread. I used my standing mixer, but I’m fairly certain you could do the whole process by hand if you needed to. The results you get and the pride you’ll feel when you see those beautiful buns (snicker) will make every ounce of effort well worth it! Not to mention the benefit of knowing EXACTLY what is going into your food and avoiding things like HFCS. Combine the water, milk, yeast and sugar in a measuring cup. Let stand for 5-10 minutes to proof, you’ll know it’s working when the top gets foamy and the yeast is dissolving. In a small bowl beat 1 egg. In the bowl of a standing mixer, whisk together the 2 flours and salt. Add the butter* and use your fingers to rub it into the flour, it should start to look like wet sand. Make a well in the center of the flour and pour in the yeast mixture and egg. Fit the mixer with a dough hook. 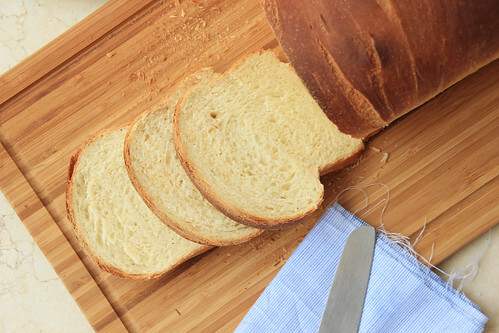 Knead on low speed for 6 minutes, until the dough is smooth and elastic. It will be sticky, and that’s OK. If it seems dry, add a little extra water a tablespoon at a time. Shape the dough into a ball and return it to the bowl. Cover with a clean towel and set in a warm place for 1-2 hours, or until the dough has doubled in size. (Mine took an hour and 15 minutes). Line 2 baking sheet with parchment paper. Punch down the dough and turn out onto a very lightly flour surface. Divide the dough into 8 equal portions. Shape each portion into a ball and place 4 on each baking sheet, allowing room for rising. Gently press down on each one so they are a little flatter. Cover lightly with plastic wrap and allow to rise for another 1-2 hours, until doubled in size. While the buns are rising, beat the second egg with one tablespoon of water. 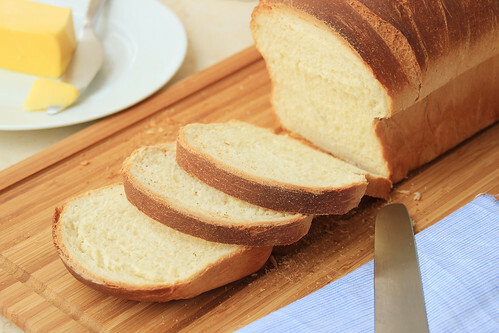 Preheat the oven to 400 degrees and place a shallow baking pan filled with water on the flour of the oven, or on a rack in the lowest position. 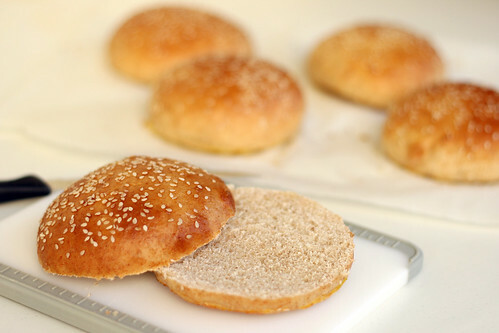 When the buns have risen, brush the tops with the beaten egg and sprinkle with sesame seeds (if using). Bake for 15 minutes, turning the pans halfway through, or until the tops are golden brown. Cool on a wire rack. 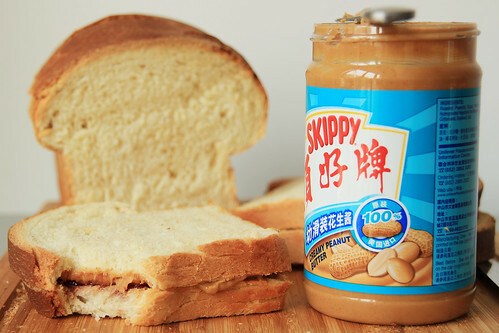 Excellent, when lightly buttered and toasted and topped with something delicious like a burger or shredded chicken or pulled pork. *To make the butter step easier, I actually used cold butter and used a cheese grater to grate the cheese into the flour. From there it was easy to rub together. These yeast rolls were one of my non-negotiables for my 48-hour Thanksgiving. I love, love, love these rolls. They’re buttery rich with a soft, fluffy texture. Yes, a bag of store bought rolls would have been faster. But it wasn’t something I was willing to budge on, even if it meant a little extra work. Not that I really mind that kind of work. I mean, extra work doing dishes, not my cup of tea. Extra work watching dough rise, punching it down, and shaping it, my idea of a good time. Let’s say you have more than 48-hours to plan your meal. Perfect! You can make this dough ahead of time! To do that, follow all the steps through the shaping. Once the dough is shaped, freeze them on a cookie sheet until hard, then you can transfer them to a Ziploc bag if you like. The day before you need them take them out of the freezer and let them thaw in the fridge. Bring them to room temperature and then let them rise another 30-45 minutes before baking. 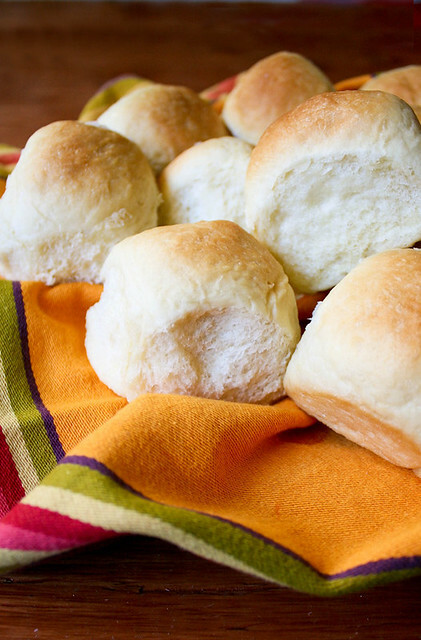 All in one day or frozen for later, you’re going to love these rolls! In the bowl of a standing mixer fitted with the paddle attachment, dissolve the yeast in the warm water. Let stand for 10 minutes, until it starts get foamy and the water looks milky. Add the milk, butter, eggs, sugar, and salt and turn the mixer on low to combine. Add 3 cups of flour and beat until smooth. Remove the paddle and replace it with a dough hook. Add 4 more cups of flour and let the mixer knead the dough for 5 minutes. The dough should become smooth and elastic and just slightly tacky to the touch. Add up to 1/2 cup more of flour if the dough is too sticky. Move the dough to an oiled bowl. Cover and let rise in a warm place until doubled in size, about 1 hour. Towards the end of rising, butter two 9×13 pans. After the dough has risen, punch it down in the center and turn out on a floured surface, knead it by hand for a minute or so. Cut the dough into 24 even pieces* and place in the prepared 9×13 pans. Melt 3 tablespoons of butter in a small bowl and stir in the honey. Brush the tops of the rolls. Cover and let rise for 30 minutes, or until doubled in size. In the meantime, preheat the oven to 350 degrees. Bake rolls for 20-25 minutes or until the tops are golden brown. *Usually I do 12 rolls per pan (and 1/2 recipe for just one pan) but for Thanksgiving I made smaller rolls. For smaller rolls divide into 40 pieces (20, 4 rows of 5, per pan). That’s right. 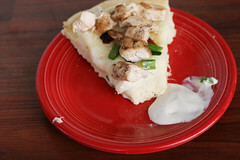 You read the title right; Mashed Potato Pizza. I told you last week that Jesse is heading back out to China soon and before he leaves I’m going to fill him up with carb-y goodness. And before I see comments about evil carbs, please know that this isn’t the kind of meal you’re going to have all the time. Everything in moderation. Don’t worry, the following night we had a very healthy dinner with a small side of brown rice. I can’t take full credit for this idea. Back in Ohio being an Irish dancing teacher meant occasional weekend commitments for dancing events. This would usually mean lots of time fixing wigs, zipping dresses, tying shoes, and saying “shhhh, the audience can hear you”. But it also meant all of us teachers going out for a nice dinner after the event. 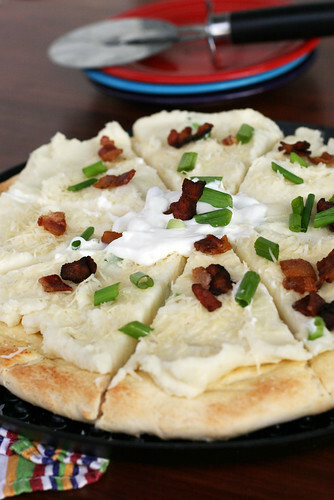 After the beginner recital we went to a place called Watson Bros Brewery, and they served the most unusual and delicious dish – Mashed Potato Pizza. Sadly one day I went and the doors were closed. But I never stopped thinking about it. And I finally recreated it. Possibly even better than the original. *The chicken was a little minute addition I made to attempt to round out the meal. Preheat the oven and a pizza stone to 450 degrees. Shape the pizza dough into a 12 inch circle**. Add the garlic to the melted the butter, then brush over the entire top of the dough. Carefully move the dough the hot pizza stone and bake for 8-9 minutes, or until the top starts to turn a light golden brown. Remove the dough from the oven. Spread 2 tablespoons of sour cream over the top of the pizza dough. Then spread the mashed potatoes. Return to the oven for 5 minutes until the pizza dough seems crisp and the mashed potato peaks just begin to turn brown. If you want you can turn on the broiler for a minute, just keep an eye on it. 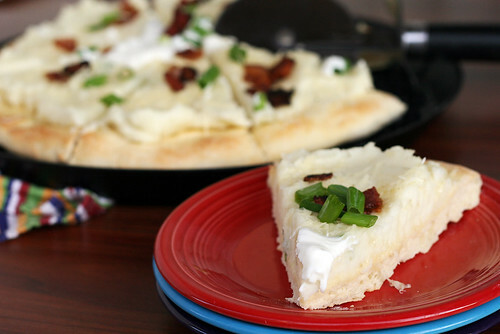 Top the pizza with Parmesan cheese, green onion, bacon, chicken (if you’re using it) and a big dollop of sour cream in the middle . Serve with additional sour cream or Ranch dressing, if desired. ** I shape my dough right on a piece of parchment paper so when it comes to moving it to the hot stone all I have to do is slide the paper over. Add potatoes, garlic, and 2 teaspoons of salt to large saucepan filled with water. Bring to a boil and cook for 10-15 minutes, or until the potatoes are easily pierced with a fork. Remove from heat and drain water from potatoes. Add the kosher salt (for some reason I think the rough kosher salt helps the potatoes mash easier, could be in my head, but it’s what I always do) to the potatoes and use a potato ricer to begin mashing the potatoes. Add the butter, half and half, and sour cream and continuing mashing and stirring until smooth. If they seem dry you can add a little more half and half or milk. Test the taste and season with pepper and, if necessary, more salt. Stir the yeast and sugar into the warm water. Let sit for 8-10 minutes, or until the water looks creamy and the top is foamy. Stir in the melted butter. In the bowl of a standing mixer (or large mixing bowl) stir together the flour, salt, and garlic powder. Create a well in the center and pour in the water/yeast. If you’re using a standing mixer, turn the mixer to low and let it knead for 5 minutes, adding more water a teaspoon at a time if necessary. If you’re not using a standing mixer begin stirring together with a wooden spoon and when it gets tough to stir start kneading with clean hands. Knead by hand for 10 minutes. Shape the dough into a ball, place in a lightly greased bowl, and cover with a clean towel. Let rise for about 30 minutes. * This pizza dough is incredibly forgiving. I make it at least once a week and more or less go by feel of the dough now. If you want to let it rise for longer and double you can, but you can also just let it rest for a few minutes and roll it out. The longer the rise, the lighter your crust will be. The shorter the rise, the denser the crust will be. I do it both ways all the time but I guess I can say that I prefer a 30-45 minute rise.